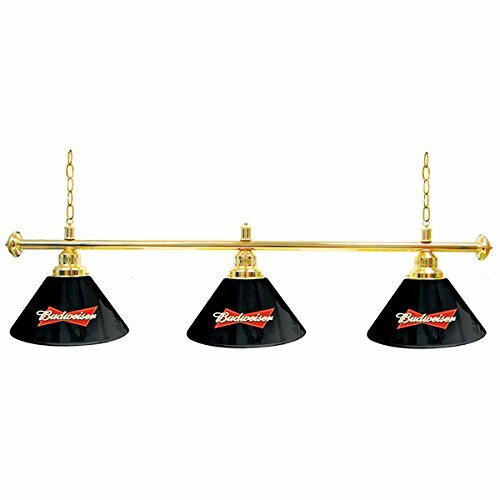 With three sleek shades, this Budweiser lamp makes the perfect bar light fixture for over your pool table! The durable brass support structure supports three beautifully branded lamps that are hardwired for easy overhead installation. Pay tribute to the King of Beers with and score just the right amount of light for your bar or game room. * Specs - Dimensions: 60"W x 14"H x 14"D and Weight: 20 lb. The 3 shade Budweiser Billiard lamp is the perfect addition to any Billiard room. Measures 60 inches in length and each lamp is 14 inches in diameter and complimented by a full color graphic.